President Trump told reporters today his administration is working "like a fine-tuned machine," in the wake of this week’s resignation of his national security adviser and the withdrawal of his nominee for labor secretary. "This administration is running like a fine-tuned machine," Trump said. "Despite the fact that I can't get my Cabinet approved, and they are outstanding people." Ten of his 22 Cabinet-level nominees have yet to be approved, the most in U.S. history four weeks into a new presidency. "I've also worked to install a Cabinet over the delays and obstruction of Senate Democrats," he said. "I turn on the TV, open the newspapers, and I see stories of chaos. Chaos. Yet it is the exact opposite." His national security adviser, Mike Flynn, resigned from his post earlier this week amid questions about his communications with the Russian government during the transition period. And fast-food executive Andrew Puzder withdrew his nomination for labor secretary after questions about his employing an undocumented immigrant and his wife's now retracted allegations of abuse. One of Trump's major moves so far — an executive order temporarily barring travel to the United States from seven Muslim-majority countries — is no longer in effect after being blocked by the federal courts. 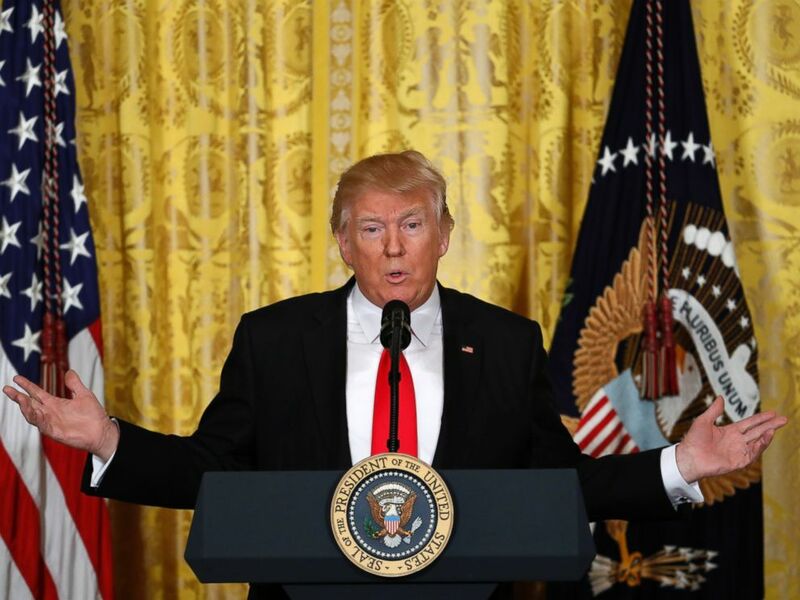 President Donald Trump speaks during a news conference, Feb. 16, 2017, in the East Room of the White House in Washington.